Businesses that have fleets of vehicles have increasingly turned to fleet cards to help them to manage their fuel and repair expenses. These cards are credit cards that the businesses can give to their employees who drive for their jobs. The employees can charge fuel and repairs on their fleet cards instead of spending their own money and submitting expense reports. A 2011 study that was completed by Stiel Direct found that 90 percent of businesses that had fleets used fleet cards. Fleet fuel cards help businesses to get rid of paper-based reimbursement processes and allow for easier tracking of expenses. However, some fleet cards may also be targeted for fraud by employees. 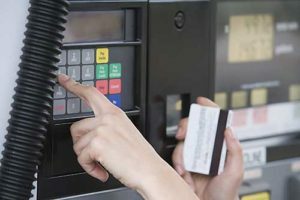 A fleet fuel card is a credit or debit card that is given to company drivers who regularly drive vehicles for their jobs. They can use the cards to pay for gas and vehicle repairs. Many fleet cards are credit cards that are issued by specific gas station chains such as Shell Oil or Conoco. These cards can only be used by drivers at Shell, Conoco, or other similarly co-branded chain gas stations. Fleet cards allow drivers to buy fuel and to get their company vehicles repaired when they are traveling on the road. Using the cards eliminates the need to pay for the business-related fuel and vehicle repair expenses out of pocket, lessening the chance of employees becoming angry because of slow reimbursements or of workers not having the money to buy fuel or to pay for repairs themselves. How does a fuel card for fleet vehicles work? Fleet fuel cards are given by businesses to personnel who drive fleet vehicles as a part of their jobs. They differ from corporate credit cards because they can only be used to make purchases that are required for the fueling and maintenance of the company’s vehicles. Employees who are given fleet cards are able to use them to fuel their company vehicles. If their fleet vehicles break down while they are on the road, they can use the fleet cards to pay for the repairs. 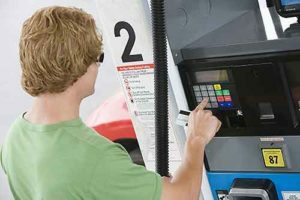 Fleet cards that are branded by specific chain stations can only be used at gas stations that are members of that chain. 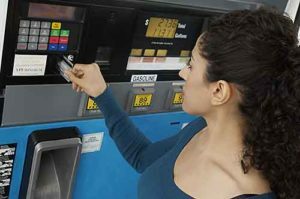 There are also other fleet cards that can be used to purchase gas from any station that accepts Visa, Mastercard, Amex, or Discover. How can a fleet fuel card help me to grow my business? If your business has a fleet of vehicles for your employees to use, getting fleet cards to distribute to your employees can help you to grow your business. Fleet cards can allow your employees to make purchases in a timely manner so that you can ensure that they arrive with their cargo to their destinations on time. Fleet cards also help you to save on the expenses that are associated with paper-based reimbursements. Reimbursement processes are rife with fraud from employees who submit personal expenses that they claim were made for the business. When you give them fleet cards, you can help to eliminate fraudulent reimbursements, saving your company money so that you can concentrate on growth. How do I research a fleet fuel card? There are many different fleet gas cards from which you can choose. To make certain that you choose a fleet card that will work best for your business, it is important for you to conduct in-depth research. You can look at various cards online and compare their costs, where they can be used, and any expense control features that they might have. A good way to research gas cards is by visiting trusted sites that have reviewed different companies that offer fleet cards. You can read the reviews from the site as well as other companies that have used the fleet cards to get a better idea of how well they might work for you. What makes for the best fleet debit card? A fleet debit card might be a better choice than a fleet credit card for several reasons. Debit cards are not credit cards, meaning that you won’t have to submit to a credit check and will not be charged interest on the purchases that are made. Fleet debit cards also do not add anything to your company’s debt but instead allow your employees to use your money to pay for the fuel and repairs that they need. The best fleet debit cards also offer added benefits, including expansive expense controls. With the best card offers, you can limit your employees’ ability to make purchases other than fuel at the pump. If they try to buy items inside of the gas stations, their purchase attempts will be declined. Because the best fleet cards allow you to see the spending on each card in real time, you can also spot misuse much faster so that you can address it appropriately. One of the primary benefits of giving cards to your employees for your fleet vehicles is that you can eliminate the expense associated with reimbursements. Companies that do not have fleet cards must contend with processing reimbursement requests and expense reports. When these reports are submitted by employees, it can take a substantial amount of time to review and approve them. Employees who are forced to wait several days or weeks to get their money back may become upset. In the future, they might refuse to purchase fuel or to pay for repairs when they are needed out of their own money, causing problems for your business. Who benefits the most from fleet gas cards? Any business that has a fleet of vehicles or several employees who are required to drive as a part of their jobs can benefit from fleet cards. These fleet cards can help companies that range in size from small businesses with a few vehicles to large companies with large fleets. Smaller companies may derive the greatest benefit from switching to cards for their employees who drive, however. Companies that are smaller may not have as many resources to track expenses as larger companies have. When they use cards to manage their fuel expenses, tracking a significant expense for their businesses can be made much simpler. Why is a fleet gas card important? Gas cards are important for several reasons. When you give your employees gas cards to use, they can fuel their vehicles when they need to so that they can arrive at their destinations on time. If your company has to meet scheduled delivery times, giving your employees the ability to use fuel cards can help to make certain that your deliveries are made on time. Fuel cards can also help to prevent your employees from using your cards to buy other items that you have not authorized. For example, an employee who is given a fuel card won’t be able to use it to charge dinner at a restaurant. This can help you to tamp down problems associated with credit card fraud that might otherwise occur. How does a fleet gas card relate to a business’s needs? Businesses that issue gas cards to their employees can monitor the spending trends of each employee. Monitoring the amount that each worker spends while he or she drives along the assigned route can help to estimate costs and to create budgets. If you notice that a particular driver is spending much more on fuel than other drivers who are driving similar amounts, you can turn the fleet card off or reduce the amount of money that the driver is allowed to spend. Gas cards can help you to identify trends in costs. They can give you more insight into your fuel and vehicle repair expenses and make your accounting processes simpler. Switching to fuel cards and away from paper-based processes can also help you to mitigate your risk of fraud. Fleet debit cards are able to be used in a similar way to credit cards. 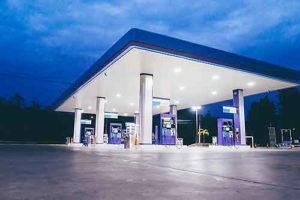 However, your employees might be able to use their debit gas cards at a broad variety of gas stations instead of being limited to a single chain of stores. Fuel purchases on gas cards also are subtracted from your deposit account so that you will not be charged interest or have to submit to a credit check for card approval. Fleet credit cards require credit checks of both business owners and their businesses. In many cases, the business owners have to agree to be liable for the balances on the fleet credit cards. These cards often charge high interest rates and high annual fees. They are linked to revolving credit lines, so purchases that are made add to your company’s debt. In a fraud case example that involved the fraudulent use of a fleet city card, a public works employee of the city of Richmond, Kentucky was fired from his job because he used a city gas card to purchase fuel for his own vehicle. According to news reports, William Settle lost his job in 2015 after another employee saw him use the city’s fuel card to fill up his own vehicle. Settle reportedly admitted using the card to fuel his personal vehicle on multiple occasions. The thefts occurred over a period of one year and amounted to a little more than $500. It is unclear from news reports how the case against Settle ultimately turned out. One common issue with fleet credit cards is that businesses cannot shut down the cards of individual employees remotely. They must instead call the card issuer and request that the card is shut down, and the process can take too much time. One solution for this common problem can be found with the business Visa debit cards that are offered by Bento for Business. These cards allow you to monitor the spending of individual employees in real time. If you see that an employee has misused his or her card, or you learn that an employee has lost a card, you can turn the card off in minutes from your mobile phone by clicking a button. Most business credit cards, including gas cards, do not allow you to limit where your employee can use the fleet cards or how much each employee is allowed to spend. An employee might use a card that you give to him or her to make unauthorized purchases or to spend more than what you have budgeted. The Bento cards let you limit where your employees are able to make purchases. You are also able to set individual spending limits by the interval that you choose and can schedule the cards to turn off when your employees are not at work. Expense reimbursements are a major problem for most companies that use them. Employees are allowed to make purchases or are expected to make purchases on behalf of their employers. They then submit expense reports with receipts to request reimbursements. The companies may take time to process the requests that they receive before they are approved. They then have to submit the approved requests for checks to be issued. Reimbursements can take several days or weeks to process, leaving the employees without access to their own money. This can build resentment among your employees and make them unwilling to make purchases on behalf of your business in the future. Reimbursements are also problematic because some employees submit fraudulent requests, causing losses to businesses. Bento allows your business to eliminate reimbursements so that you can avoid these problems. 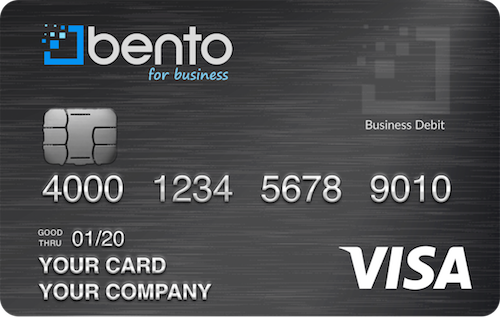 Business debit cards from Bento for Business offer multiple advantages. You can restrict the cards to be used to pay for fuel at the pump only or in any other manner that you choose. If you give John, a driver, a card that has a limit of $500, John can use the card to pay for fuel as he drives his scheduled route. If John tries to buy clothing at a store along the way, the purchase will be denied at the register. You can also give another employee a card that meets her business needs. For example, you can give Sally, your company’s marketing director, a card with a limit of $5,000. 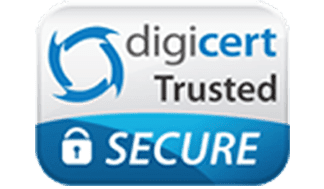 Sally can be restricted to using the card to purchase advertisements in local print media and on television stations in your area. If she tries to take her family out to dinner with your card, her purchase will be declined. Bento for Business was established by financial industry professionals who understand the particular needs of businesses. The company offers smart payment solutions to businesses of all sizes and is the trusted partner of thousands of satisfied companies. Bento enjoys terrific user reviews because of the business debit cards that it offers. You can try a free 60-day trial to see if the Bento cards will work for your business. If you have any questions, call us at 866.220.8455.